Wow, what a absolute blast. Hack Week 2.0 has now been and gone, we’ve had a weekend to relax and this week we can take the time to look back and reflect on what we achieved. We had just over four days to get our projects polished (Friday afternoon was set aside for demoing our work to the company) so it was a challenge, but one everyone on the team rose to and the results were simply outstanding. Here’s a run down of what we made. I’d love to get your feedback so please add your comments or send us a Tweet! The team was delighted with the results so we hope to keep the momentum going and begin rolling this out in the future. Moving data between our agile web apps (Trello, Pivotal Tracker, and YouTrack) is time-consuming and boring – sometimes it seems the tools that should make us faster end up slowing us down. Kiseru makes working with web apps as powerful as working with Unix tools – you can simply grab data from one app, transform it, and pipe it into another app. You can read more about the project on Github, where we’ve open-sourced the code. We’ll hopefully be adding to this over time, but feel free to fork the repo and send us a pull request! 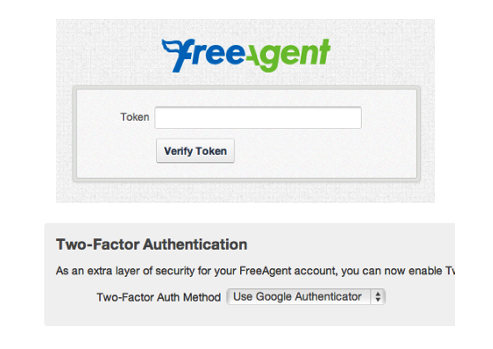 Two Factor Authentication is an extra layer of security for online accounts. It’s the idea that by adding another ‘thing’ to the authentication process, you can be more certain that the intended person is logging in and make it a bit more difficult for naughty people to break into your account. This is widely used in the world of online banking, where the two things (or factors) combined are something you know, your password and something you have, usually a wee gadget of some kind that generates a number (or token) which when used together allow you access to your account. Some online banks also have you generate a new token to confirm sensitive opperations, like transferring money. For my Hack Week project, I added this to FreeAgent. This serves two purposes, it makes our login process a bit more secure and also makes confirming destructive actions (like “Delete My Data”) a lot safer. Integration was done with Authy and Google Authenticator, can be enabled on a per-user basis and just needs the user to have a mobile phone. 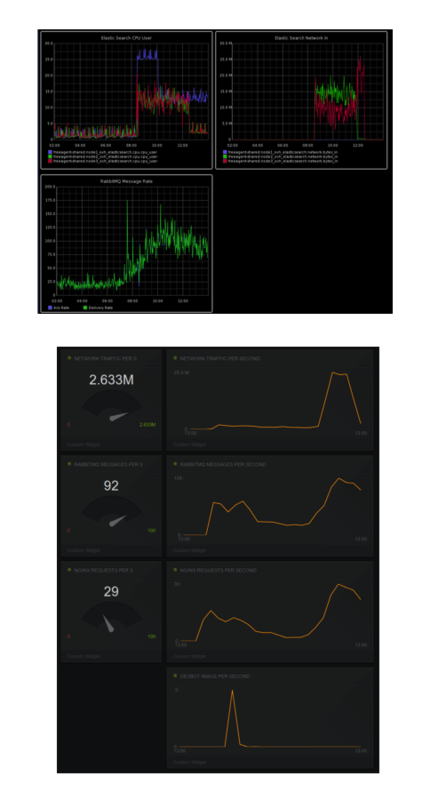 Relic as well as pushing some applications metrics to Geckoboard which we have displayed around the office. While all of this is very useful we thought that it would be great to centralise as much as possible for analysis and have a way of easily pushing choice things out to Geckoboards. Most of the metrics are time series data and Graphite was a good fit providing both storage and a powerful graph composer. By the end we had some collection agents for getting metrics out of Ganglia, New Relic, and an app to take data from Graphite and feed it into Geckoboard. 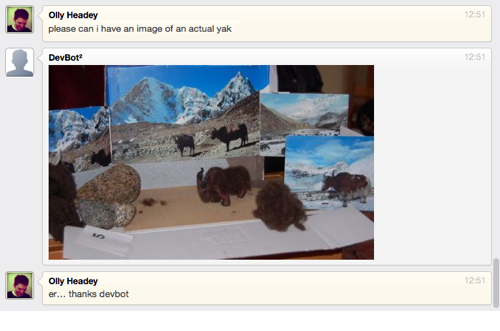 We of course started pushing metrics out from our Campfire bot as well so we can now see how many images of Yaks people request. Even FreeAgent isn’t immune from errors, but when they happen we need to capture as much information as possible about them in order to diagnose and fix the problem. We’ve been using Airbrake to track this, but it lacks some features that would make our life as developers easier – primarily the ability to search our error logs. A bit of research revealed an open-source clone – Errbit – which while still lacking the features we wanted would allow us to add them and release our additions back to the community. 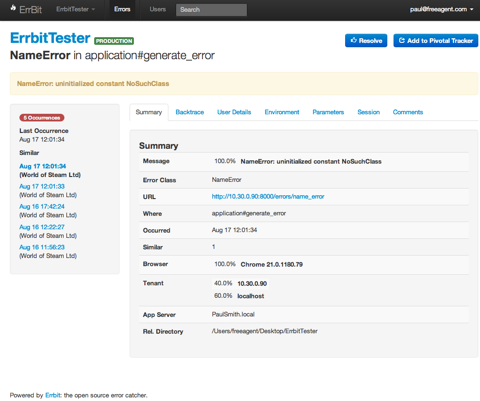 Search was added using ElasticSearch, and we also added the ability to send our error reports asynchronously over AMQP. The final bit of polish was given by reskinning Errbit using the Twitter Bootstrap framework to allow us to make the app mobile friendly and keep a consistent UI with our other internal tools. A popular request we hear from our customers is for a personal version of FreeAgent, to allow them to better manage their personal finances as well as their business ones. This has never been a priority at FreeAgent since we have so much we want to achieve with our core business. That said, some of us on the team are pretty disappointed with the personal finance products on offer in the UK, so we decided to write our own. A pretty tall order you might think, but given that FreeAgent already has a lot of suitable technology built in (bank statement processing, for instance), we decided to repurpose this and built the app from scratch. We’re calling it Shoestring. In only four days we managed to produce a working MVP. Not just a prototype, but a fully working app with authentication, statement upload and fancy reconciliation. We’re not sure where we’ll take this next, but many of the team have expressed an interest in ‘dogfooding’ it already, so you never know! 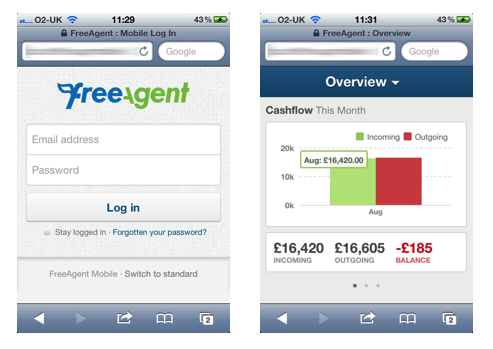 We created a new IA for the FreeAgent website supported by a set of new content guides and constraints. Using this we created a new set of content (written + video) and used this to make a mobile first prototype for the site. For my Hack Week project, I had the chance to look into profiling some of our Ruby code. The rest of the world probably knows this already, but I found ruby-prof to be exceptionally useful. first half of the week examining the distribution of real data so that I could set up realistic performance scenarios for the best and worst cases. The results can be printed in different formats. I used the MultiPrinter which outputs call stack and call graph HTML reports amongst others. The call graph simply lists the methods called and the times spent in each method. The call stack report shows this information visually and I spent most of the week looking at this. It colours the output, immediately drawing your attention to the areas that are taking up the most time. For each method, we can see the percentage of the overall runtime, the percentage of its parent’s runtime as well as the number of times it was called. The call count actually became quite important as I found that several methods were being called far more times than I would have expected for the input data, leading me to branches of code that could be avoided entirely under certain conditions. ruby-prof also outputs a grind report. This can be opened with kcachegrind (I used the Qt version qcachegrind on the Mac). This is similar to the flat call graph report but is much quicker to explore. Through the interface, you can easily drill down to different methods, seeing its callers and callees. accessed or updated. In fact, when I update a single attribute on a model instance, the serialised column is included in the SQL, even when its value had not changed. creating awesome applications. 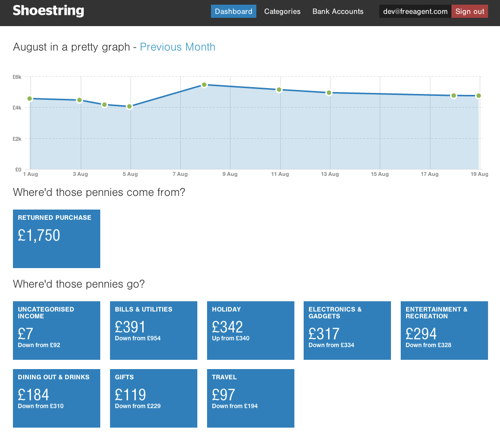 Although we have had an overwhelming response to API 2.0, we weren’t entirely satisfied. We wanted to make it even easier for developers. Scratch that; we wanted to make it simple for anyone to talk to us. So I decided to set myself a monstrous goal; write an official Ruby Client Library for our API 2.0 in a week. Ready, set, go! version of the library. Huzzah! So what does this library have? Well the library wraps the API into a lovely little package providing rails-esque querying which makes it trivial to talk to FreeAgent. Let me emphasise that for you, it is really simple. Don’t be believe me? Well see for yourself. 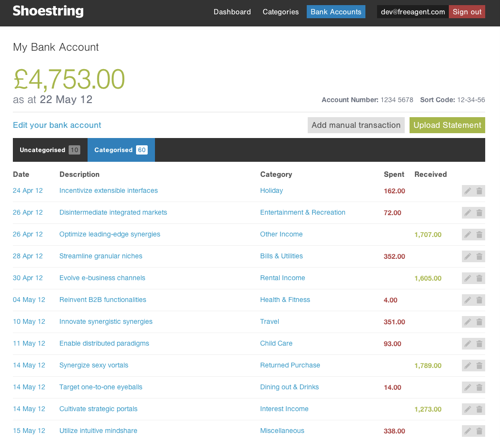 Want to find all your contacts with open invoices? So when can I have it? Soon, we promise! We plan to open source an alpha version very soon once further testing has been done. As always we hope to get feedback on it and we’d love to see contributions from the community. Although it is possible to submit timeslips on FreeAgent, it isn’t possible to time your work and automatically create timeslips. There are a number of third-party apps which will do this, but they are often abandoned. TimeAgent was a hack week project to develop our own time tracking app. At FreeAgent we use OS X so the TimeAgent prototype was developed using Cocoa and the FreeAgent API. This means that when we’re ready, we can release TimeAgent on the App Store, making it really easy to download and install. As it stands at the end of hack week, TimeAgent allows you to fetch your projects, contacts and tasks from FreeAgent and] then create timers locally without an internet connection, allowing you to work from anywhere! Looking to the future, we’d like to add the ability to create projects, contacts and tasks locally so you can use TimeAgent without a FreeAgent account. If you did then create a FreeAgent account, we could automatically sync everything you’ve created, allowing you to easily turn your tracked time into invoices. 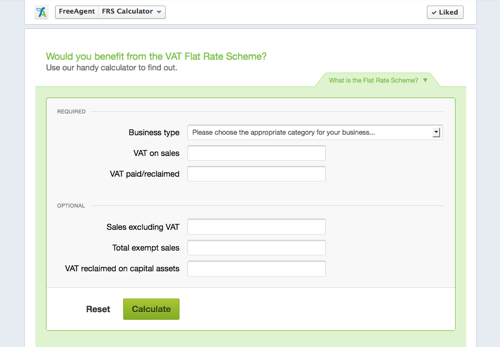 For the past week we have been working on a Flat Rate Scheme calculator for our lovely Facebook users. We have been thinking about doing this for a while, and Hack Week seemed like the perfect opportunity to start working on such an app. Even though the functionality of the calculator itself is quite simple and we thought we would be able to make the app available by the end of the Hack Week, we had to spend a lot of time thinking about the best way to present the form and the result to the users. The result was a working demo that – with a little polishing – will be soon ready to go live on our Facebook page. It was great fun working on something a bit different, and we are already looking forward to the next Hack Week!